Terror Films is hellbent on ensuring that you can find their films literally everywhere! 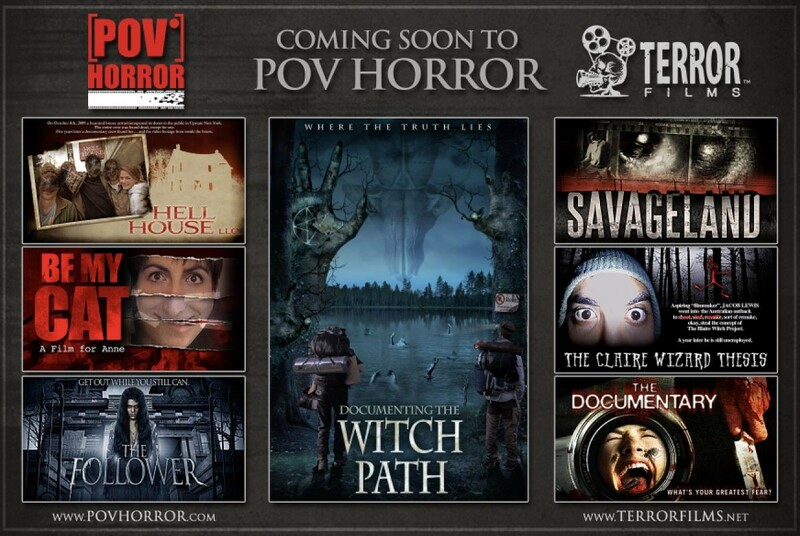 On the heels of their recent partnership announcement with VOD streaming site Popcornflix, the digital indie genre distributor is at it again as they prepare to launch seven of their found footage films on the popular subscription streaming service - POV HORROR. The release will include a mixture of titles. To begin the partnership the wildly successful Hell House LLC and politically charged Savageland, will debut on this platform. Next, the stalkeresque thriller The Documentary will be available. The slate will also highlight films from international filmmakers such as The Blair Witch Project spoof The Claire Wizard Thesis (from Australian filmmaker Ishak Issa), the critically acclaimed Be My Cat: A Film for Anne (from Romanian filmmaker Adrian Țofei), the paranormal thriller The Follower (from French filmmaker Kévin Mendiboure), and the never-before-seen Documenting the Witch Path (from Swedish filmmaker Carl Sundström). The official poster has been included here, for Documenting the Witch Path, with the official trailer set to release soon. This documentary follows three young filmmakers in search of a haunted lake where innocent women, accused of witchcraft, were drowned in the 17th Century. TERROR FILMS' President Joe Dain had something to say of this partnership. Dain said of the film slate and working with POV HORROR: “we are thrilled to be working with POV Horror. In this very competitive market, we rely on platforms such as POV Horror to help us continue to grow our digital footprint and introduce our ever-growing and diverse library of horror films to new audiences." A larger audience can see the best TERROR FILMS has to offer on POV HORROR, this April! POV Horror is available on Roku, Amazon Fire TV, Apple TV, Chromecast, and the web. This fall, POV Horror is launching on Android, iOS and xBox.